All Science Journal Classification (ASJC Codes list): Elsevier have been selected to provide citation data for the 2014 REF. Elsevier own the Scopus database which covers almost 18,000 titles from over 5,000 publishers. 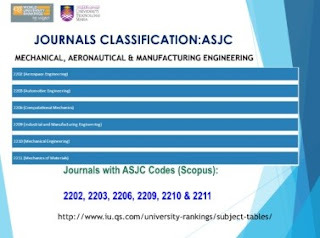 Each journal in the database is assigned to one or more subject classifications, using their ‘All Science Journal Classification’ (ASJC) codes.